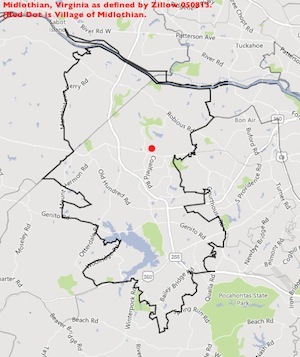 The boundaries shown below were proposed for the Midlothian Area in 2011 by the Chesterfield County Planning Department staff and their consultants, with input from the community. This map was not made part of the final Comprehensive Plan in 2012. The history of the streetlights in the Village of Midlothian raises issues about the role of the county's government that any new Midlothian Area Plan should address. How to create a new area plan for the Village of Midlothian? Besides the process outlined by the Planning Department in 2011, another look at how community planning might be done for the Village of Midlothian can be seen in the detailed report released in January 2013 by the group pulled together by Chesterfield County and City of Richmond to study the area on US 360 around the Chippenham Parkway. Details are here. Read the Chesterfield Observer summary here. 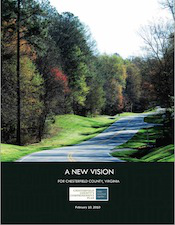 In 2012 Chesterfield County adopted the first major changes to its Comprehensive Plan in some 20 years. One key conclusion from the process was the public's strong support for "village plans" that would help create a "sense of place" in communities such as the Village of Midlothian, Bon Air and Chester. process costing close to a million dollars of taxpayer funds and almost two years. Much of the 2010 "vision" from the planning staff and consultants was modified or rejected by the Planning Commission. Little has been done as yet (middle of 2013) toward creating new standards for the village such as streetlights, sidewalks, building style and signage guidelines and traffic flow. One of the major issues will be defining the boundaries of the villages, followed by determining the practical priorities. A newspaper report on a January 2011 citizen meeting on the proposed plan noted, "The county’s current Comprehensive Plan was adopted by the Board of Supervisors over two decades ago. Since then, the plan has grown into five countywide and 22 area plans. [Midlothian District Supervisor Dan] Gecker cautioned that the current area plans should not be dismissed. “I know a lot of people in this room that have spent a lot of time working on these area plans,” he said. Another concern [expressed at the meeting] addressed is how the draft Comprehensive Plan, if and when adopted, would provide specific guidelines as is outlined in current area plans. [County Planning Manager Barbara] Fassett stated that the specific details would be undertaken in a focus strategy that is outlined in the Action Matrix (Action Code A-S 8), which is not adopted as part of the Comprehensive Plan. The focus strategy team would be comprised of a long-range planner, a zoning planner, a landscape architect, a traffic engineer, and a member from the economic development department. “The kind of suggestions that come through will be based on already adopted policies. We will monitor it and come back in three years for review,” she said. Much was changed in the final comp plan from the initial proposals in 2011, so the county's process regarding the Midlothian Area Plan may be different under the final guidelines approved in 2012. Nevertheless, the current decades-old Midlothian Area Plan was supposedly set to be revised and updated, if not completely overhauled, in 2013. 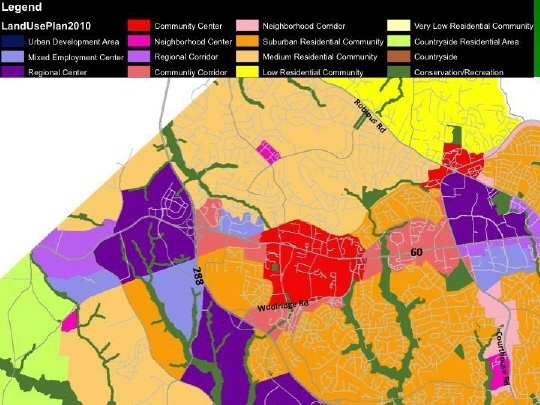 Any new plan holds the potential of having a major impact on the long-standing , albeit out-of-date and inadequate, development standards for the Village of Midlothian and other "villages" in Chesterfield County. What process will be used as well as what to change about the Midlothian Area Plan was an issue of those debating the details of the new comprehensive plan. But the Planning Department, the Planning Commission and, ultimately, the Board of Supervisors, individually and as a group, said they recognized the public's support for an effort to do something specific to create a "sense of place" in parts of the county.